Walls: Travels Along the Barricades is now in the running for The City of Calgary W. O. Mitchell Book Prize. The second time I’ve been up for this prize – Poets and Pahlevans was also nominated a few years back – and is another example of the generous support and encouragement I’ve received from Calgary’s cultural community. 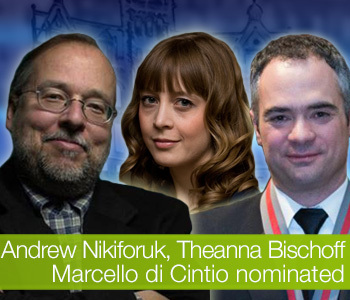 Andrew, Theanna and I will be reading from our nominated books on May 14th at the Rose and Crown Pub in Calgary. Join us there, if you can. The Award itself will be handed out at the Calgary Awards on June 12th.